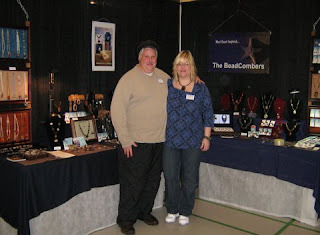 We're the BeadCombers, a husband and wife team, who together share our love of creating fun things for others. These days, with so many talented Artisans in Canada and here on the Island, we've been able to etch a little mark on the big map, and have gained a regular clientèle through various Shops and Galleries. Jewelry making has been my passion for more than 20 years and my husband a little more than 10 years. Bill works primarily with Prehistoric Woolly Mammoth Tusk Ivory, Antler, Wood, Resin and Semi-precious stones. The Ivory is obtained from Northern BC and Yukon where Miners are finding it buried in Permafrost. The Ivory is also known as Legal Ivory as Mammoth has long been extinct. The Antlers are Elk, Deer, and Moose and obtained from local hunters. Wood are vaious kinds, from BC Pine, Cedar, Spruce, and Yew to more exotic small 'scrap wood' such as Kingwood, Macasar Ebony and Purple Heart. These exotic woods, while very costly are too small in use for larger projects, but value added in jewelry as not much is wasted in this way. Tina works with semi-precious stones, recycled glass, wire and polymer clay. Wire is woven, knit and crocheted, polymer clay is sculpted and shaped into multi media creations that resemble beach pebbles and much more. Beaded designs include Picasso pendants, wire forms wrapped with semi precious stones, beaded and sculpted dragonflies. We create and design many more things than are listed here, but please visit the links in the right side bar for an idea of what we do and what we sell. "wonderful tutorials. I recommend any of Tina's tutorials. " "Super fast response to order. Tutorials are excellently written and beautifully photographed to show every step in both of these. I am grateful! Bonnie, Miller Moods"
"As always Tina's tutorials are awesome. I am learning so much from her. Now to get her to hold a week long class at her studio!!! We are very much inspired by our surroundings on the West Coast, we do however cater to differnet tourism areas also. How can I purchase a piece of jewelery? you can email us. On the right side bar is a clickable email link or email me at beadcomber at yahoo dot com. Although I received both comments in my email, you didn't leave any way for me to contact you back (your blogger profile doesn't have an email address linked), so all I can do is leave a comment here in return and hope you come back to visit to see this. Retail and Wholesale - Whether you are interested in just that 'one' piece or a variety, please inquire about Prices, availability and custom jewelry cards. Items presented are for sale or can be made to order. Due to the handmade nature of items, please allow for variances. Satisfaction guaranteed.